The Third Wave Research Papers look at a book by Alvin Toffler that divides societal history into three phases. In his book The Third Wave, Alvin Toffler divides societal history into three phases which he calls “waves.” Have the writers at Paper Masters custom write research on The Third Wave or integrate the book into a research paper written according to your exact guidelines. Using the symbolism of waves, Toffler argues that the phases overlap. Therefore, there is no definite beginning or end to a phase, and where the waves collide, conflict springs forth. The “First Wave” was concerned with agriculture and took place over thousands of years. The Second required about three hundred years to mature and was a direct result of the Industrial Revolution. 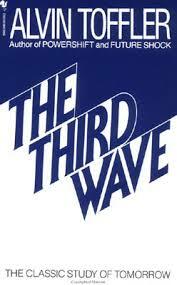 The Third Wave gives the book its title and represents a coming global shift. Toffler goes to great lengths to distinguish between First Wave society and Second Wave society. Three of the major differences between the two are the family unit, the structure of business, and gender distinctions. Before the industrial revolution, for example, family forms varied from place to place. But wherever agriculture held sway, people tended to live in large, multigenerational households [...] all working together as an economic production unit [...] And the family was immobile--rooted to the soil. He goes on to explain here that with industrialization came a shift to the cities and an inherent mobility. Since extended families could not be as mobile, nuclear families became the norm. With this shift away from rural life and family came changes in education. Children were no longer educated individually, but instead, were sent out of the home into a “mass education system.” This system revolutionized education and business as it taught “basic reading, writing, and arithmetic [... and] three [covert] courses: one in punctuality, one in obedience, and one in rote, repetitive work”. The underlying curriculum Toffler details taught students to become better production workers and paved the way for large corporations. Instead of essentially self-sufficient people and communities, it [The Second Wave] created for the first time in history a situation in which the overwhelming bulk of all food, goods, and services was destined for sale, barter, or exchange. It virtually wiped out of existence goods produced for ones’ own consumption [...] Everyone became almost totally dependent upon, food, goods, or services produced by somebody else. Sociology Book Reviews - The Third Wave - The Third Wave research papers look at a book by Alvin Toffler that divides societal history into three phases. Paper Masters writes custom research papers on The Third Wave and look at a book by Alvin Toffler that divides societal history into three phases.